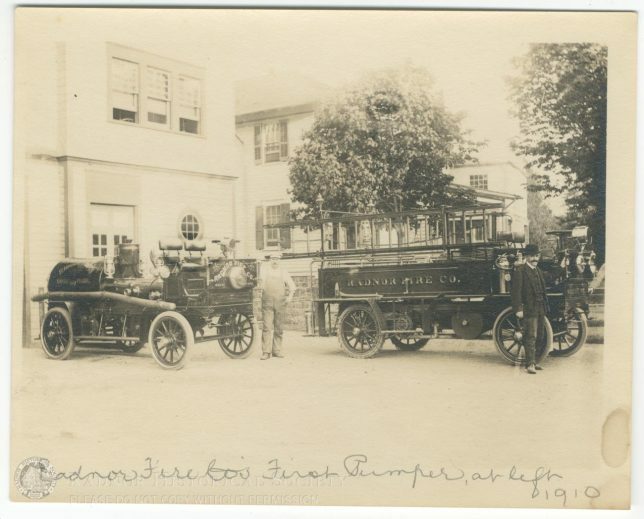 The picture illustrating this week’s column was taken in June, 1911, after the Radnor Fire Company had for several years been the proud possessor of its first two pieces of gasoline-propelled fire fighting equipment. To the right is their first acquisition, the Knox combined automobile and hose wagon, purchased in 1906, while to the left is the Knox-Waterous automobile gas-engine of the two-cylinder, air-cooled type. The man standing a the side of the latter is a firehouseman, employed by the Radnor Fire Company for a short period to care for the new gas-driven fire engines, the mechanics of which were so little understood at that time. Although with the passing of the years his first name has been forgotten, Charles Clark remembers that his last name was Turnbull. The man at the right was Jack Clark, remembered as “quite a town character” and no relation to our present fire chief or his family. In the immediate background of the picture is the original fire house, as it appeared before any of the additions were built. To the right are two buildings that were landmarks in their day, although each is but a memory now. The first is the Coffee House, while next to it is the first Radnor township school building to be erected on the large plot of ground now owned by the School District. The Coffee House was first built as a meeting place for the Women’s Christian Temperance Union. Later it was turned into the Coffee House still remembered by some of the pupils of Wayne School of an earlier era for the excellence of the soup it served. Many others ate there, including Wayne’s business men and drivers of the many horse drawn trucks on Lancaster Pike. The use of the building was given without rent by a well-known local resident, as long as no intoxicating liquors were sold in the township. Before the Wayne Neighborhood League occupied its present quarters on West Wayne avenue, it was also housed in this building, which was not destroyed until its site was needed for the first unit of the present High School building, erected in 1923. So much for this quaint old picture, which is all the more valuable now since the two fire engines themselves gradually rusted away on the vacant lot back of Lienhardt’s store. Since the engine purchased in 1906 was the first piece of motorized fire fighting equipment to be put into operation in the United States, it might well have found a permanent place in the Smithsonian Institute, or similar sanctuary, along with its sister engine acquired in 1908. There is only one relic of Radnor Fire Company’s first engine still in the Company’s possession. That is the bell which was once attached to the front of the old chemical and hose wagon. It now hangs on the upstairs wall of the fire house and is sounded to call meetings to order. In discussing the disastrous Wayne fire which really sparked the movement to obtain good fire protection in Radnor township, A. M. Ehart, editor of “The Suburban”, told your columnist of the early morning blaze which totally destroyed his newspaper plant in the early morning hours of Saturday, February 10, 1906. The building was a pleasant, two-story, yellowish-red brick edifice on the site of the present Allan C. Hale building, and was entirely occupied by “The Suburban”. No one ever really knew the origin of the intense blaze which left nothing standing except a few foundation bricks, as shown in the picture on the front page of “The Suburban” of February 16, 1906. All had been well as far as Wayne’s night watchman knew when he stopped by at 4:00 A. M. to light the gas under the linotype machine. The shrill warning of a Pennsylvania Railroad engine as it went past on the tracks to the rear of the building gave the townspeople the first warning of the blaze. When Wayne’s horse drawn fire engines arrived on the scene, they found that the fire had gotten a tremendous start in the corner of the building where the linotype machine had stood. Although the Bryn Mawr Fire Company engines were also called into action they arrived late, as they could make but little time over bad roads. The loss was a total one, even tot he files of “The Suburban”, which could never be replaced. At the same time the “Suburban” building was burning, Frank Heuslein’s harness shop, which stood to the east of it, caught fire, with much loss to the contents of the shop as well as to the living quarters of the Heuslein family. The site of the shop is now occupied by Peter diBlaio, antique dealer. By the Monday morning following the disastrous Saturday “The Suburban” had resumed operation of its paper from the Downingtown plant, where it continued until 1916, when it occupied the Maguire Building, where it is now located. While the printing was done in Downingtown, the business of the newspaper was carried on in an office formerly occupied by Dr. J. C. Ward, with the still-familiar Wayne 123 (0123) as the telephone number. The Heuslein Harness Shop was also able to resume business shortly after the fire. This February 16, 1906, edition of “The Suburban”, under the headline of “Steps Being Taken for the Organization of a First Class Fire Company in Wayne–Prominent Men Back of Movement”, tells of a meeting held on the Tuesday evening following the fire, which was attended by many of the foremost citizens of Wayne and St. Davids. The article also goes on to state that “subscriptions were being procured for the purchase of a modern combination chemical and hose truck similar to the one used by the Bryn Mawr Company, plenty of hose and all the equipment needed to fight fires successfully. Stringent rules have been made and enforced. This then was the actual beginning of our present efficient Radnor Fire Company, in the formation of which “the three Charlies” figured so prominently – Charles Wilkins, Charles Clark and Charles Stewart. In order to assist your columnist in assembling material for this series of articles on the Radnor Fire Company, Andrew L. Fritz paid a visit to Wayne recently to reminisce about the early days of fire companies in Wayne. Mr. Fritz, whose name is among the 24 signers of the 1906 charter of the present Fire Company, now lives in Upper Darby, although he was for many years a resident of Wayne. In telling of the North Wayne Hose Company, which antedates the Wayne Chemical Company by several years, Mr. Fritz recalls that it consisted of a hose reel and little ladder truck, all hand drawn. George Baker, who lived almost directly across the street from the building which was headquarters for the Hose Company and now known as the Legion House, was always immediately on the scene as soon as an alarm came in, thereby earning his appelation of “chief”. Among his faithful assistants in pulling the truck was Miss Mary Biles, who was later to become Mrs. Andrew Fritz. Another helper was a colored girl named Anna Miller. As the majority of North Wayne homes were built slightly before those in South Wayne, it was natural that that section should have the first organized fire department. When the Wayne Chemical Company was formed in South Wayne, its equipment consisted of hose reel and combination chemical wagon, according to Mr. Fritz. Sometimes the hose cart was hitched bak of the chemical wagon. At first hoses for this two-wheeled vehicle were obtained from Lienhardt’s Bakery, in which connection Mr. Fritz recalls that Dr. Lienhardt had great interest in the Fire Company at that time. Later, the horses came from R. H. Johnson’s “not very often the same two horses”, according to Mr. Fritz. Eber Siter, at that time the foreman for Johnson’s often brought the horses down to the fire house from the company’s stables. Several very disastrous fires occurring in quick succession had much to do with the formation of the present fire company. The Andes home on the Lincoln Highway near Strafford avenue as well as a twin house nearby, was a total loss, as was the building on East Lancaster avenue, then occupied by “The Suburban”, when it caught fire a short time afterwards. The latter was on the site of the present Allan C. Hale Company building. All of these structures could have been saved had there been proper fire protection in the township. According to Mr. Fritz, there was much casual talk along these lines in the pool room, which was then on the first floor of the Masonic Hall, where the Wayne Red Cross Headquarters is now located. Charles H. Stewart, who was then secretary of the Board of Commissioners, became very much interested in the project of a well-organized, motorized fire department. Frederick H. Treat, another member of the Board of Commissioners, was equally enthusiastic and he undertook to interest other members of the Board. And so, in 1907 Radnor township acquired its first piece of automobile equipment, to be followed only a year later by a second piece. “The Radnor Fire Company has for some time possessed a Knox combined automobile chemical and hose wagon, which is capable of a speed of 20-miles-an-hour, and carries two 35-gallon chemical tanks, two 3-gallon portable chemical extinguishers, 1,000 feet of 2 1/2 inch hose and minor equipment. It has answered 18 alarms without the loss of a minute by accident or hold-up of any sort.” A picture of this quaint old vehicle, along with that of Radnor’s latest piece of apparatus, illustrated last week’s column. According to Mr. Fritz, this original Radnor fire engine at first received its full share of ridicule from the townspeople. And even before it was finally accepted by the Fire Company it had to undergo various tests. Mr. Fritz recalls that Mr. Treat designated the old road on the Wright place leading from Brook road to Old St. David’s Church as the final stretch along which the fire truck was to make a successful run. Much of the purchase price of this Knox chemical and hose wagon was raised by door-to-door solicitation of funds, although the Commissioners made a contribution from their treasury, also. The second piece of fire-fighting apparatus was acquired in the spring of 1908, a year after the purchase of the first one. A full description of this engine appears in “The Fireman’s Herald” of April 4, 1908, in an article illustrated by a very clear picture of this now quaint vehicle. According to the Herald, “Radnor Fire Co. No. 1, of Wayne, Pa., has just received a fire engine of a new pattern. It is an automobile gasoline machine, and consists of a truck chassis made by the Knox Automobile Co., of Springfield, Mass., with an independent gasoline drive pump manufactured by the Waterous Engine Works Co., at St. Paul, Minn. The automobile engine is of the two-cylinder air-cooled type. The pump is driven by a separate engine constructed by the Waterous Company, and is of the four-six-inch rotary cylinder type. The cooling is accomplished by a pipe from the pump, and the amount of cooling is adjustable so as to be readily adapted to the requirements of service. There are two separate and distinct systems of ignition provided. The pump is connected by clutch directly with the engine shaft, and has a capacity of about 400 gallons a minute”. “The test was made in the presence of many firemen from that section, and was personally superintended by F. J. Waterous, of the Waterous Company, in charge of Charles M. Wilkins. Draughting from a cistern and playing through 950 feet of hose, and a 1 1/2 inch nozzle, the engine forced a stream 101 feet; with a one-inch nozzle, 125 feet; with 500 feet of hose and a one-ince nozzle, 141 feed, and with a 1-1/8 inch nozzle, 130 feet. With 400 feet of hose a perpendicular stream was tried against a stack 155 feet high. A strong wind was blowing and it was impossible to keep the stream steadily against the stack, but the stream came within 15 feet of the top. With 3/4 and 7/8 inch nozzles two effective perpendicular streams were thrown a distance of 125 feet. The “housing” of this Knox-Waterous automobile was an occasion for a parade, a banquet and a ball, all of which will be described in next week’s column. So reads, in part, the opening paragraph of the handsomely framed charter of the Radnor Fire Company which still hangs on the second floor of the fire house on South Wayne avenue. It is signed by 24 subscribers, and dated March 15, 1906. Isaac Johnson, President Judge of the Court of Common Pleas of Delaware County, attached his signature to the decree, as did R. J. Baldwin, Recorder of Deeds, and W. I. B. McClenachan, Deputy Recorder. The first clause of the “articles and conditions of said association” sates that its name shall be “Radnor Fire Company of Wayne”. The second states that its purpose is “for the control of fire”, the third that its place of business is Wayne, Delaware County, Pa., and its fourth that the corporation is “to exist perpetually”. The 24 names of subscribers in the order in which they appear on the charter are: Charles M. Wilkins, Charles E. Clark, L. B. Gault, Edward G. Fritz, Andrew L. Fritz, Nathan P. Pechin, Charles T. Worrall, George Deuber, John S. Detterline, Jr., Albert McAllister, Joseph M. Devereaux, W. H. Gault, John A. Duff, Howard F. Pennell, Richard Leary, A. A. Sellers, Patrick J. Duf, David P. Duff, W. Clarence Lucas, W. W. Gualt, George G. Lentz, J. Herbert Reynolds, Frederick H. Treat, and Charles H. Stewart. With the exception of Mr. Pechin, who lived in Radnor, and Mr. Stewart, who lived in St. Davids, all were residents of Wayne. Directors for the first year as listed in the charter were the Messrs. Stewart, Worrall, Treat, Pechin, W. H. Gault and John H. Duff, with the president, who was still to be elected at that time, to serve in an ex-officio capacity. W. W. Hearne was later chosen for that office, serving from 1906 until 1917. It is interesting to note that the first two subscribers to sign the charter have sons who now, some 46 years later, are actively connected with the Radnor Fire Company. “Eddie” Clark has been the popular Fire Chief for some 19 years past, while Leslie D. Wilkins, whose activities have extended over a long period, is the Chief Engineer and Secretary. Both Mr. Clark, Sr., and Mr. Wilkins, Sr., served at various times as chief of the Fire Department. The latter is now deceased, but Charles M. Clark is Fire Co-ordinator for the State Defense Council, he now spends most of his time in Harrisburg. The first semblance of an organized fire company in Wayne was formed soon after the Civil War with headquarters in what is now the Legion House on Beechtree lane. It was called the North Wayne Hose Company. An organization formed slightly later was the Wayne Chemical Company. Subsequently these companies were sponsored by the North Wayne Protective Association and the Wayne Public Safety Association, which originally took over both police and fire protection for their respective districts. The charter members of the present fire company, when it was formed in 1906, were drawn from the membership of both these groups. The nucleus of the buildings which are now the fire company’s headquarters on South Wayne avenue was built by the Wayne Public Safety Association sometime in the ’90’s. At that period the fire company’s chief piece of equipment was a chemical wagon pulled by horses hastily obtained from the R. H. Johnson Company, on Conestoga road, whenever the alarm for a fire was sounded. At that time there were both front and back exits through which a horse-drawn fire engine could be drawn. All of the ground back of the small building was an open field. The old Coffee House then stood on the site of the present high school building, while the high school itself was located in the present grammar school before the annex was added. When the present Radnor Fire Company, as formed in 1906, had been in successful operation for ten years, the small building which it had been occupying since the Wayne Chemical Company had gone out of existence was formally deeded to them by the Wayne Protective Association. This was in 1916, and by then it had become apparent that the Radnor Fire Company needed larger quarters. The original building was placed on rollers and pushed farther back on the property in order to make room for the addition planned by the Radnor Fire Company. Pictures of the original building show that its front door, which faced West, is identically the same door by which voters enter the polls after turning to the let when they first go into the fire house on the High School side. The present stairway, as well as the upstairs room and the room underneath, belonged to the original small building. After this first addition was made in 1916, further enlargements came in 1936 and 1948. The ambulance, purchased in 1947, then found permanent quarters in the one-story annex tot he South of the older building. For subsequent articles in this series much interesting material on the early days of the Radnor Fire Company, obtained from several of the Charter members of the organization, will be presented to our readers. It was an eventful day for the community when the big shiny new Mack 1000-gallon pumper, equipped with the latest in fire-fighting apparatus, arrived in Wayne last August. As it stood outside the Fire House in all the glory of the American LaFrance “fire engine red” paint, the eyes of all passers-by were on it. Many of the grownups joined the admiring group of youngsters as the latter clustered around it. Its trial spin around the streets of Wayne attracted still wider attention. All of Radnor township felt a justifiable pride in this latest addition to one of the best equipped fire companies in the State of Pennsylvania. This was, indeed, a far cry from the days when a three-foot fire horn, such as was owned by each Wayne householder in the 1880’s, sounded to call out the neighbors to fight any fire that might occur in the community. One of these horns is now among the most interesting exhibits at the headquarters of the Radnor Historical Society on Beechtree lane. Old records show that even in the early days of Wayne, fire protection was considered very essential. Householders took nightly turns in patrolling their neighborhoods. So serious was the matter of the blowing of these three-foot horns that any unwarranted use of one called for a fine of five dollars. A bucket of water stood behind the front door of each home in the township. The use of this was a first aid measure while the young men of the community rushed out to “man the pumper.” This was a 500-gallon hogshead of water on two wheels with a hand pump attached. While some of the volunteers pulled the ropes tied to the tongue of the pumper, others pushed from the rear. Down-hill, or even on the level, the method of locomotion was not too difficult. For uphill runs it was well-nigh impossible. Usually, there was little salvage after a fire had really gotten some headway. The present fire company, formed in 1906 by a group of 21 residents of the community, has seen such steady growth in the intervening years that the handsome new Mack pumper so recently acquired is but one of the fleet of five pieces of fire-fighting apparatus, each piece capable of handling a fire by itself. Any one of the five may be sent to a fire to combat or to control it. In addition tot his array of fire trucks there is the handsome and well-equipped ambulance, which alone answered 329 calls in the period between April 1, 1950 and April 1, 1951. During this same time there were 279 fire calls, making a total of 608 calls, which the Radnor Fire Company had answered in the course of one year’s time. The new Mack truck features the high pressure fog system, the most recently developed technique for putting out fires with the least amount of damage possible. It carries 300 gallons of water and approximately 1000 feet of 2 1/2-inch hose. Before the acquisition of this truck the newest piece of apparatus was the 750-gallon Mack pumper acquired in 1948. It carries 1400 feet of hose, a fact very reassuring to the property owner whose home is located at a distance from the nearest fire hydrant. Other trucks include the Chevrolet, purchased in 1940, with its 200 gallon pump, its 150 gallons of “booster” water and its 500 feet of 1 1/2 inch hose; the Ford, bought in 1939, with its 100-gallon pump and the Autocar “quad” (quadruple combination) which was acquired in 1937. The latter has a 600 gallon pump; 1100 feet of 2 1/2-inch hose; two 65-foot ladders and other different types, varying from eight-foot collapsible to 50-foot extension. The different types of ladder operated by the Radnor Fire Company are extension, wall and roof ladders. In enumerating the engines and equipment of the Radnor Fire Company, Chief Edwin J. Clark tells your columnist that there is only one possible thing which a large city company might have that is lacking Wayne–this is an aerial ladder. Among the many interesting and up-to-the-minute pieces of equipment which they do possess is a portable cutting tool in the form of an acetylene torch that would be capable of cutting an automobile in half, should this be necessary. Other equipment, of which the community may well be proud, is the fire company’s emergency lighting system, to be used at night at the scene of a fire; the foam generator for gasoline fires and the newest equipment for both high and low pressure fog. And then there is the radio inter-communication equipment, by which all the trucks may keep in contact with each other, as well as with the fire house headquarters. Incidentally, Radnor was one of the first fire companies to be radio-equipped, having acquired its set even before Philadelphia. Among other accessory possessions are several asbestos suits that enable firemen to go right into a blaze without too much danger; masks of various kinds; many types of forcible entry tools; salvage covers to protect furniture and roof covers that effectively keep out the weather until repairs can be made. Much of the technique of the newest methods of fire-fighting is acquired at the Fire School held in Lewistown, Pa., each year. Radnor Fire Company attempts to send several representatives to each session of this school, which is run by the Pennsylvania Department of Public Instruction. Chief Clark himself seldom misses a session. On one occasion the question was propouned as to what methods to —— out a fire in a gasoline or ——- on the road. Of the 72 fire chiefs present, Mr. Clark was the only one who had actual experience along this line, the occasion being the well-remembered fire of this kind on Spring Mill road several years ago. “Eddie” stated that his men had put out the fire with low velocity fog. The others attending the School said this could not be done, whereupon the Session adjourned to the proving field, where the actual experiment was tried by putting gasoline in a tank and scattering more around it. The effectiveness of low-velocity fog was proved, just as Wayne’s Fire Chief had stated. Following this question came another concerning the best methods of extinguishing fire in an airplane accident. And again “Eddie” was the only fire chief present with actual experience in this direction. Although no other fire chief present had had experience with airplane fires, Mr. Clark had two on which to report. The first was the crash of an Army Air Force P-38, on the rear of a property on Waterloo road, Devon. The plane was on its way to Aberdeen Proving Grounds, Md., but went off its course in a heavy rainstorm. Radnor Fire Company extinguished the flames and immediately afterwards the State Police and Army representatives took over. The second plane accident occurred in Radnor township itself on June 15, 1949, when a private plane took of after having made a forced landing on County line road, Villanova. Neighbors called the fire company, which reached the scene in seven minutes with four pumpers, ladder truck and ambulance. The fire was put out with the fog apparatus. Pilot rescue was impossible from the beginning–all that the fire company could do was release the body form the safety belt after extinguishing the flames. The plane apparently came into contact with high power lines of the Pennsylvania Railroad immediately after take-off.